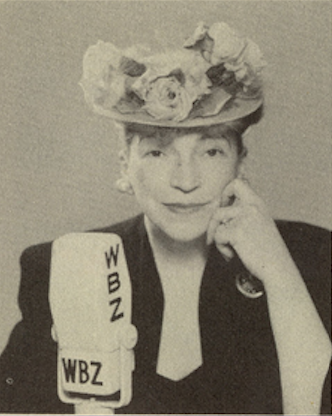 Marjorie Mills was a trailblazer for women as a reporter for the Boston Herald and Boston Evening Traveler and as an on-air personality on WEEI, WNAC and WBZ in the 1930’s, 40’s and 50’s. Renowned newspaperwoman and radio personality Marjorie Meader Burns, known as Marjorie Mills, was born in Waterville, Maine in 1892. She was a trailblazer for women in Boston media and became a household name throughout New England. Marjorie attended Colby College, the University of Kansas and the Eric Pape Art School in Boston. In 1916 she began her career as a reporter for the Waterville, Maine Sentinel. She then became the first woman on staff at the Boston Herald and Boston Evening Traveler as the Women’s Page Editor and Food Editor. Her by-lined stories and her social column, “Dear Everybody,” were widely read and quoted. It was on radio, however, that she made her name. In the mid 1920s she was a guest on WNAC radio on a show called “The Women’s Club,” and by the late ‘20s she hosted her own show on WBZ, “Home Forum Cooking School.” In 1930 the show was syndicated as “New England Kitchen of the Air” and in addition to WBZ also ran WTAG/Worcester, WJAR/Providence and WCSH/Portland in afternoon drive. By the late 1930’s she was hosting “The Marjorie Mills Hour” on WNAC which was still going strong into the 40’s. Later in the 40’s she moved back to WBZ to host “Window on the World.” Her announcer for more than 17 years was Carl DeSuze. In her distinctive husky voice she talked to women about things important to them. Over the years, she interviewed celebrities such as Jackie Onassis, Richard Rodgers, David Merrick, Carol Channing, Lionel Barrymore, Elizabeth Arden and Grace Coolidge and she was good friends with Hedda Hopper. In 1977 she received the Yankee Quill Award from the Society of Professional Journalists, Sigma Delta Chi, for her years in broadcasting. Mills retired in 1966 and passed away on April 5, 1979.